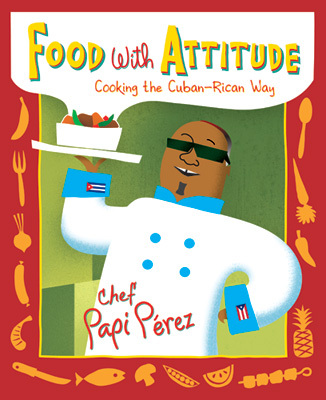 Here's a cover I did recently for a soon-to-be-published cookbook: "Food with Attitude: Cooking the Cuban-Rican Way". "Join Chicago’s very own Chef Papi Pérez on a culinary journey where flavor and health-conscious food go hand-in-hand. In this unique cookbook Papi Pérez shares recipes from his many years as a certified Kosher chef and restaurant consultant." It's being published by Wicker Park Press Ltd. and will sell for $27.95. Newer PostThe Evil Bean: in the clutches of "demon" coffee.